FILE - Lydia Balderas, left, and Merced Leyua, right, join others as they protest against a new sanctuary cities bill outside the federal courthouse in San Antonio, June 26, 2017. 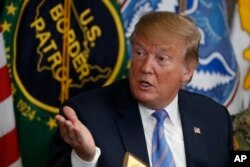 President Donald Trump participates in a roundtable on immigration and border security at the U.S. Border Patrol Calexico Station in Calexico, Calif., April 5, 2019. FILE - Families hoping to seek asylum in the United States wait on the bridge connecting Reynosa, Mexico, to Hidalgo, Texas, March 15, 2019.